Princeton student-athletes, representing a variety of sports, celebrated Dr. Seuss Day with Monument Elementary School in Trenton, NJ where they read Dr. Seuss books to school children as part of the PVC Reading with the Tigers Program. The PVC sponsors multiple Reading with the Tigers events throughout the academic year. The program is geared to get Tiger student-athletes out in the community, promoting the benefits of reading, serving as role models to young kids and expressing their commitment to service. 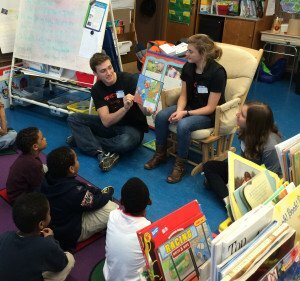 Reading with the Tigers has been greeted with great enthusiasm by Princeton student-athletes which is surpassed by the excitement generated through their presence in classrooms at local schools. Click here to view the photo gallery from the most recent Reading with the Tigers event.